Consumers see wellness apps as a way to meditate and improve sleep. Investors see profits. Meditation and sleep apps have raised hundreds of millions of dollars in venture capital, hinting at the start of a new lifestyle business. Cheng, 25, a nonprofit project manager in the San Francisco Bay Area, is a paying member of Headspace, one of a handful of apps focused on meditation and wellness that have accrued millions of users — and millions of dollars in venture capital investments. She said she found the app after dealing with a “post-grad crisis” after college. Now, it helps her relax and fall asleep. But like the many other smartphone notifications Cheng receives throughout the day, she isn’t always in the mood to hear from Headspace. Smartphones have trickled into almost every part of modern existence, and meditation and wellness are no exception. Device use is so common, detox programs are now popular — and the average person receives 65 to 80 notifications a day, according to research from Duke University. The paradox that even meditation apps may be the cause of anxiety has not stopped millions from turning to devices for relief, making it a lucrative new market in the app economy. Users like Cheng and Gordon have contributed to the growth of this new market, proving consumers are willing to pay for apps that provide some mental relief. Cheng pays “just under $100 a year” for the apps, a price she says is worth it. Calm, another popular meditation and sleep app, charges about $70 for a year. That success has been met with sizable investments from venture capital firms. Headspace has raised $75 million from investors, while Calm recently topped that, raising $88 million and being valued at around $1 billion. 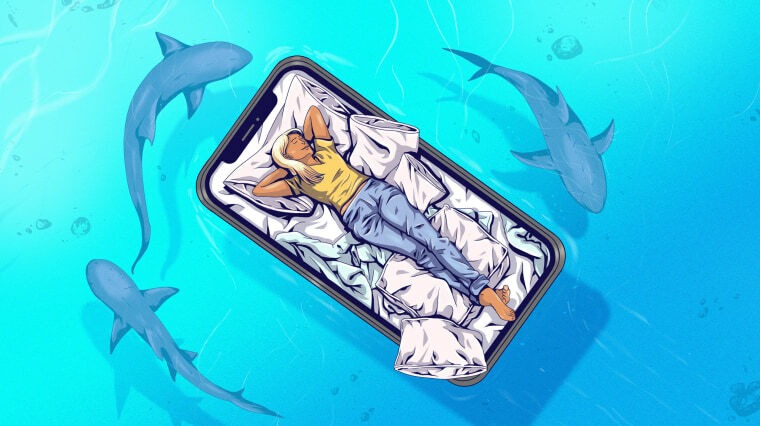 The rise of these apps has coincided with growing concern among consumer advocates, wellness gurus and even big tech companies about smartphone addiction. Michael Acton Smith, co-founder and co-CEO of Calm, said that smartphones can still be a force for good. “The mobile phone gets a lot of bad press, but if you use it correctly, it’s an incredibly positive thing in our lives,” Acton Smith said. He noted that wellness apps have gained popularity due to a cultural shift away from overworking. That cultural shift is something investors hope to capitalize on. Sleep, wellness and meditation have already shown signs of becoming fodder for new lifestyle brands. Arianna Huffington, co-founder of HuffPost, turned herself into a sleep guru, while a broader industry has grown around the idea of self-care. Kevin Rose, an internet entrepreneur who is now a venture capitalist at True Ventures, operates meditation app Oak, which is free. Rose said that while he sees benefits in the apps, he also noted that they're a good business because they are relatively inexpensive to run. Rose said Oak supports more than 140,000 monthly users and only costs about $700 per month to run, making it reasonably easy for him to offer it free. While it might not cost much to record a guided meditation, it is a bit more expensive when it's read by Hollywood actor Matthew McConaughey, like on Calm. Rose said that paying customers can be more engaged due to the value they put on the apps but said that he has some reservations about what the business model means for users. “We want people to get off their phone and actually practice on their own,” Rose said. Experts that spoke with NBC News said meditation and sleep apps can be good for people trying to manage stress, but are not without drawbacks. I hate when software I use to improve my depression (ie meditation and fitness apps) use a streak tracker. It just makes me feel even worse about my bad days when I can’t keep up. Feels like yet one more failure. “There have been a lot of studies of meditation and its benefits, both for physical and mental health,” Janet Kennedy, a sleep doctor in New York City, said. Screens emit “blue light,” a type of wavelength that suppresses melatonin, one of our main hormones for sleep. “Some of the apps are just audio, which is fine, but we don't recommend any that flash or that have you look at an orb to do your breathing work,” Augelli said. Kennedy also worries the apps are making their users overthink sleep. “There is a downside to all of the attention sleep is getting,” she said. Most of the apps offer streaks and track how much you use them. Some record how much you end up sleeping. “Not too long ago people had CDs or tapes to help them fall asleep.” Now, Augelli said, they use apps.